The small farming town where this fair story takes place is home to good, peaceful folk, who spend the majority of their time and energy attending to their prize-winning vegetable gardens in preparation for the annual vegetable harvest festival. They are simple people with simple values like hard work, community and being humane to all creatures. Perhaps the same can be said for WALLACE & GROMIT IN THE CURSE OF THE WERE-RABBIT creators Steve Box and Nick Park. Years of dedication and attention were required to assemble this first feature for the Academy-Award-winning characters of Wallace and Gromit, and this film highlights similar themes to Park’s previous claymation feature, CHICKEN RUN, like being kind to all the animals. However, choosing all the right vegetables does not a great stew make. 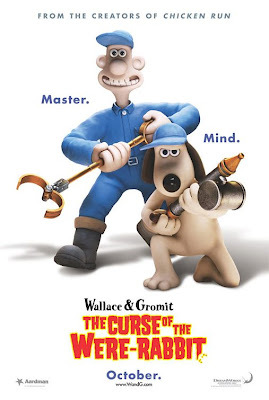 Wallace (voiced by Peter Sallis) is a goofy, awkward, good-natured fellow who owns and operates his own security company to protect the villagers’ prize vegetables, along with the help of his reliable and crafty dog, Gromit. They are always successful, always humane and always admired until the appearance of the Were-Rabbit (a giant freak cross between a rabbit and a werewolf). It is their mission to save the vegetables so that the festival can go on as planned. Without this festival, these people will have nothing so there is a lot hanging on Wallace and Gromit’s heads. Lady Tottington (voiced by Helena Bonham Carter) is Wallace’s potential love interest and her persistent suitor, while Victor Quartermaine (voiced by Ralph Fiennes) acts as the counterpoint to Wallace’s humane approach to pest control by insisting that violence is the only way to effectively attack their problem. 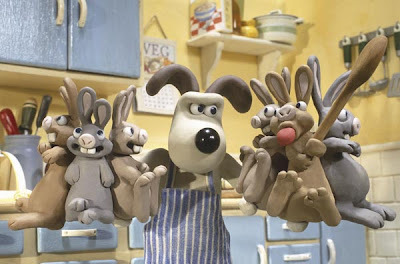 It’s a solid story with solid characters and some solid laughs but WALLACE & GROMIT IN THE CURSE OF THE WERE-RABBIT is about as exciting as well, a vegetable festival in a small town. I first wondered if perhaps I had not tried to see the film through the intended audience’s eyes. After all, it’s colorful, the characters are enjoyable (in fact, Gromit is downright endearing) and there are sporadic moments of excitement and laughter. Then I noticed that none of the children in the audience seemed to be having very much fun either. Without trying to sound extremely cliché, the film lacked heart and today’s kids (this larger one included) didn’t bring theirs from home to make up for what was lacking … But damn those rabbits were cute.